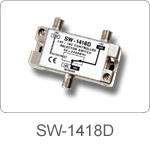 The SW-1418T and SW-1418D are RF selection switch use in satellite receiving system.It can accept two signal from LNB of satellite dish then selecting the other one to pass via 14V / 18V of satellite receiver. The signal of satellite dish 1 is passed to satellite receiver and signal of satellite dish 2 is OFF, when satellite receiver send out less than 14V of LNB power. If the satellite receiver change the LNB voltage higher 15.0V then the signal of dish 2 is passed and the signal of dish 1 is OFF. • Wide Band, High Isolation. • Zinc Die-cast Hybrid Case. • Gold Plated "F" Type Connector Pins.